Another beautiful made to measure dress. Fabulous quality. Cannot wait to wear it. We ll made, comfortable and just fits. Thank you. love it so much. Never imagine it can be so beautiful with the good quality. Quality of material is good, the dress is everything I wanted,. Very happy and it was delivered in a timely matter for my event. Dress is gorgeous! Fits like a glove as per measurement guide. Love it, color is good, fit is good, definitely a great find. The quality of material and craftsmanship are excellent. The color and look of it are as represented. Perfect for my dad's wedding, absolutely loved the dress. Love my dress, fits well and looks great. Thanks for the great service too!!! Ah the junior bridesmaid-too old to be a flower girl but too young to be a bridesmaid. Yet for the younger participants in your wedding party, finding the right junior bridesmaid dresses are equally important. Balancing style and comfort along with modesty and a youthful look can be challenging but not impossible! We offer over 100 junior bridesmaid dresses to fit your needs. How about a capped sleeved pleated short dress with floral detailing? It comes in all shades of pink, blue, purple, white, greens and many others! Match the color with the rest of your wedding party or make your junior bridesmaid stand out with a different style but same color or perhaps the same design but different color. The combinations are endless and sure to please even the youngest member of your wedding party. Cue the “oohs” and “ahhs.” This expansive junior bridesmaid dress collection is filled with cute and colorful outfits your girl – and all your guests – will love. Dressing your tween bridesmaid in age-appropriate attire can be tricky. That’s why all our junior dresses update the latest trends and timeless silhouettes with a modest twist. Expect sweet lace frocks with high necklines and subtle v-necks paired with floor-length chiffon hemming. We have all the beautiful details to make her feel grown-up but grounded with unique youthful elements so she still looks like your little girl. These junior bridesmaid dresses look gorgeous with pearls, jewels and anything with sparkle, so let your tween put her own cute spin on things. Need a wider range of sizes for your wedding party? Pink Princess stocks a variety of suitable Junior Bridesmaid Dresses! From discount junior bridesmaid dresses to those hard to find age appropriate Black Junior Bridesmaid Dresses. All our junior bridesmaid dresses are available in a variety of styles that seamlessly complement our signature line of bridesmaid gowns for girls and tweens. Browse an array of sleeve, hemline and silhouette options all tailored just for her. Whether your ladies are rocking laidback maxis or knee-length A-lines, you’ll find an adorable counterpart in this unique junior collection. And, for an even more harmonious match, these cute bridesmaid dresses come in a range of exclusive bridesmaid dress collection. No matter your theme, vision or venue, you’ll discover a cute dress to complete your wedding day. For little girls, tweens and everyone in between, we have a beautiful junior bridesmaid dress to suit her tastes and your wedding-day dream. Searching for a superb Cheap Junior Bridesmaid Dresses that will fit your budget? Once you have selected your desired bridesmaid dress, you can always have a look at the reviews and see what other brides who have worn the dress have to say about it. 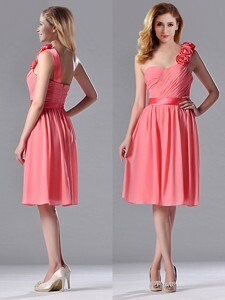 You can even ask them directly and better decide if you really want to buy the bridesmaid dress. Long gone the trend when you had to wear Cheap Junior Bridesmaid Dresses only one time. Now, we're all about recycling! DressesABC.com has a multitude of dresses that can be worn on different occasions. Sometimes the accessories make the difference between a cocktail dress and an evening gown. We also have an impressive accessory collection. So, you can find everything you need for fabulous looks at DressesABC.com. And everything is available for affordable prices! Our collections will surely cater for all kinds of tastes. The beautiful and outstanding Cheap Junior Bridesmaid Dresses is all you need. Our collections makes it a breeze to find you a perfect one.